Neck 19cm-25cm, Width 1cm, Size X-Small; The collar does not stretch itself, please make sure leave only 2 fingers between collar and dog neck. This collar is a single product. However, it comes with matching lead/harness to complete the look. Lead and harness sold separately. Vibrant color combination, consisting of hot pink, light emerald, and black. Available in multiple sizes, can be accommodated with any breed! Those buckles are made from ecofriendly plastic; The metal D ring is chrome coated to add durability. Our Pink Flaming Print Dog Collar with D-ring is ideal for any pooch who likes to romp in the swamps of Miami and chase those long-legged birds! 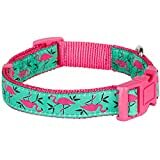 This jacquard-trimmed collar features hot pink flamingos with a light emerald background color sewn onto the hot pink nylon webbing. These buckles are matched with hot pink color to complete the look! This fashion dog collar is perfect for everyday use. This entry was posted in Dogs and tagged 19cm25cm, Available, Basic, Blueberry, Collar, Collars, Dogs, Emerald, Flamingo, Harness, Lead, Light, Matching, Neck, pink, Separately, XSmall by One Boutique. Bookmark the permalink.